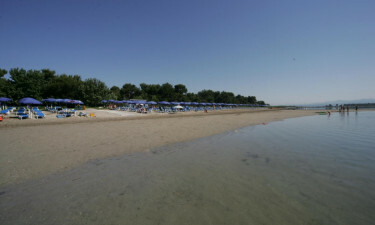 Villaggio Europa-Grado is a luxury camping site situated on the Gulf of Trieste in north-eastern Italy. Villaggio Europa-Grado offers the ultimate in luxury camping – or ‘glamping’ as it is sometimes known – with a variety of comfortable mobile home accommodation, equipped with all modern conveniences and laid out on tree-lined pedestrian walkways. For more information on the unique character of this luxury camping site, contact LUX-Camp today. 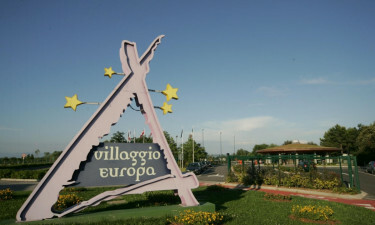 Why should I camp at Villaggio Europa-Grado? 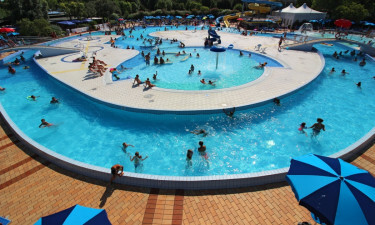 The water park at Villaggio Europa-Grado offers something for all the family, with geysers, whirlpools and slides for the young, or young at heart, and inviting deckchairs and sun loungers for those who prefer a more relaxed pace to their camping holiday. All the water park attractions are perfectly safe, even for young children, and trained staff are always on hand, not only as a safety precaution but also to organise a daily entertainment program for younger visitors. Beyond the luxury camping site itself, Villaggio Europa-Grado has its own beach, awarded Blue Flag status for the quality of its bathing water, facilities and safety, including lifeguards. The water is shallow and calm, making it safe for children, and due to its high iodine content, reputedly therapeutic for sufferers of back or joint pain. Water sports, including sailing, water skiing and windsurfing, with instruction, are also available. Visitors may like to known that July is the warmest month of the year in north-eastern Italy, with an average temperature of 22.7 °C. For holidaymakers who want excursions of architectural, historical or natural interest, Villaggio Europa-Grado is ideally situated for the historic seaside town of Grado, with its medieval centre, or the ancient Roman city of Aquileia, which is now a UNESCO World Heritage Site. Historical interest aside, Grado is also home to some fine restaurants, with exquisite fresh seafood naturally a speciality. The famous cities of Trieste, to the east, and Venice, to the west, are also easily accessible and the Friuli-Venezia Giulia region of north-east Italy, at the head of the Adriatic, is home to many more beautiful but largely undiscovered locations. Of course, luxury eating and drinking is part of a luxury camping holiday and Villaggio Europa-Grado offers a restaurant serving everything from breakfast and dinner buffets to freshly prepared pizza and a full, a la carte menu, accompanied by a fine selection of local wines. The luxury campsite also has a beach bar, an ice cream parlour and a new, poolside bar in the water park area. Luxury camping also means never being without a few home comforts, so Villaggio Europa-Grado includes a fully stocked supermarket where you can buy fresh produce, confectionery, foreign newspapers and tobacco. The supermarket also stocks a variety of useful items, including camping spares, to make your stay at Villaggio Europa-Grado as comfortable and happy as possible.